This embedded backshell has all the features and the benefits of 38999 Series III connectors now ready to use This Souriau plug is available from size 9 to 25 derived from standard MIL-DTL-38999 Series III. 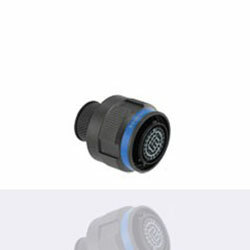 The device is compatible, among others, with VG95343 and MIL-I-81765 heat shrink boots. The plug offers better electrical continuity and signal protection, with a lighter than with standard backshell. The device is available with black zinc nickel RoHS plating; a robust QPL 500 hours finish backwards compatible with cadmium receptacle. Standard cadmium and nickel plating are also available.